This post is going to walk you through a full HA Network isolated Red Hat OpenStack installation with 3 Controllers, 3 Compute and 3 Ceph OSD nodes in only 16 simple steps. Step 1 I assume that you already have a RHEL 7.1 installation. Download the following script. Step 2 Once downloaded fill out the variables RHNUSER to UNDERCLOUD_DEBUG_BOOL. Note I set DISCOVERY_RUNBENCH_BOOL=false. If you are in a PROD environment this is not recommended as it disables the gathering of host metrics during introspection. Step 3 Run the script to prepare for the actual undercloud/director software and follow the commands which the script tells you to execute. [root@directorv ~]# chmod +x ospdirectorinstall.sh [root@directorv ~]# ./ospdirectorinstall.sh "Launch the following command as user STACK!" [root@directorv ~]# "su - stack" [stack@ospdirector ~]$ "screen" [stack@ospdirector ~]$ "export HOSTNAME=directorv.local.domb.com &amp;&amp; openstack undercloud install" "CTRL a d"
"Launch the following command as user STACK!" [root@directorv ~]# "su - stack"
[stack@ospdirector ~]$ "export HOSTNAME=directorv.local.domb.com &amp;&amp; openstack undercloud install"
Please edit the 5_registernodes.sh and add your macaddress,ipmi url,ipmi user, ipmi password, ipmi tool. I am using Joe talerico python script https://github.com/jtaleric/csv-to-instack to create the instackenv.json files. 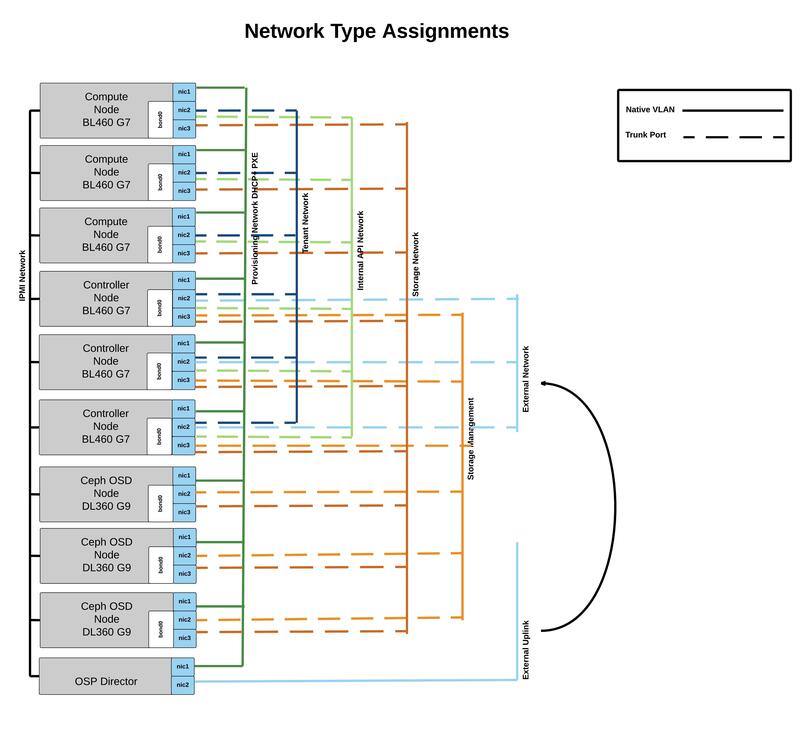 Step 9 Assign nodes to their profiles. If you used benchmark equals true you can also run the ahc-match instead of assigning the hosts manually. Step 11 Create the network-environment.yaml file so it maps to your environment. If you do not use lacp remove the bonding option as it might cause problem. # to that role) on these networks. Step 12 Now we download the files fix_rabbit.yaml, limits.yaml, ceph-environment.yaml firstboot-environment.yaml , ceph_wipe.yaml (edit this files so it reflects your disk setup) and place them in the templates and firstboot folder (we are doing some maintenance on first boot. Set the root password of the instances in the firstboot-environment.yaml if you like. The default will be redhat. Step 13 Make the necessary changes to /home/stack/templates/puppet/hieradata/ceph.yaml. In my case the journal is on the osd. Thats why the journal is blank. Step 14 Go ahead and launch the install. Enjoy your Full HA 9 node environment. i have 2 bond in control server.nic1,2 =bond 1 and nic3,4 =bond2..could you please prvide me control.yaml file for the same..also share me compute.yaml with one bond using nic1 and nic2..i am stuck with my installation and any help on this is much appreciated…i have inernal network with vlan id 356 and external vlan with 450..can we use the same vlan id of internal network (356) for all remaining network like storage,tenent etc.. Here is an example on how you would add 2 bonds. Also for the vlans 356 add them to network-environment.yaml. One possible error, I think “deploy –templates” in step 14 should be “openstack overcloud deploy –templates” ? In Step 10 and Step 13 lots of yaml’s are copied over to /home/stack/templates yet when you run openstack overcloud deploy only a very few gets called and non references back to /home/stack/templates/puppet/hieradata/ceph.yaml so is that really necessary or should that be included in the openstack overcloud deploy? how to do nic mapping and were to point that file.